A team of researchers at The Institute of Cancer Research, London, and The Royal Marsden NHS Foundation Trust, along with colleagues at seven other world-leading cancer centers in the US, utilized a simple saliva test to analyze DNA of patients with advanced prostate cancer. The new study, “Inherited DNA-Repair Gene Mutations in Men with Metastatic Prostate Cancer,” published recently in the New England Journal of Medicine found a significant proportion of patients tested whose disease may be caused by inherited mutations in genes involved in repairing DNA damage. The researchers believe that testing prostate cancer patients for mutations in key DNA repair genes could help identify those who may benefit from precision treatments that specifically target DNA repair anomalies in cancer cells. Roughly 12 percent of men with advanced prostate cancer in the current study population were found to have inherited mutations in one of the several genes involved in DNA repair—such as the breast cancer gene BRCA2. The researchers examined the DNA code of 20 genes known to have a role in DNA repair in 692 men with advanced prostate cancer. They determined 12 percent of the men had at least one germline mutation in a DNA repair gene—meaning an error that is either inherited or developed before birth. The most commonly defective gene was BRCA2, which was mutated in 5 percent of men. Encouragingly, men who have inherited mutations in certain DNA repair genes may benefit from treatment with new drugs called PARP inhibitors, which exploit weaknesses in the processes for DNA repair within cancer cells. 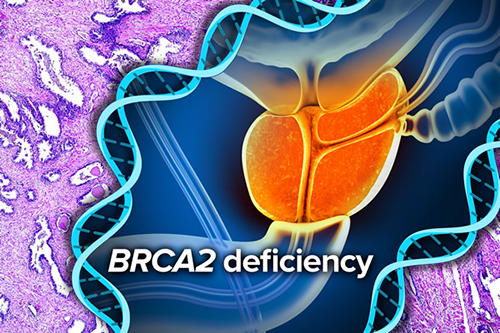 Moreover, where BRCA2 mutations are detected in advanced prostate cancer, the new study opens up the possibility that relatives could also be tested for BRCA2 mutations. Due to its aggressive nature, prostate cancer has been the focus of ongoing research for several decades. Yet, in recent years many researcher groups have focused on using advanced diagnostic techniques such as liquid biopsy to detect and track the progression of prostate cancer. Moreover, looking at DNA mutations is only one approach in studying this disease. Other studies have gathered biofluids like urine to analyze proteomic data associated with this disease. The current study is the largest of its kind to date and the first to comprehensively analyze germline mutations in men with advanced, or metastatic, prostate cancer—where the disease has spread around the body.